Canada’s healthcare sector has been showing an increase in recognizing the tremendous savings in remanufacturing its existing equipment. For years, the military, commercial airlines and industries in general have recognized the virtues of having their existing equipment rebuilt and upgraded to new standards. Imagine the savings, that we as taxpayers receive, when the military rebuilds 20 fighter planes rather than replacing them with brand new models. Surgical table remanufacturing has proven to be an excellent alternative to purchasing new equipment. Material managers, seeking a way to meet budget restrictions, have long since considered remanufacturing their surgical tables as an excellent alternative to the high cost of new tables. The surgical table is one of the operating room’s most expensive pieces of equipment. A new general surgery table currently costs, on average, anywhere from $40,000 to $70,000. Replacing existing tables with new often proves to be a very costly capital outlay, in many cases costing over fifty-thousand dollars. Remanufacturing is a very extensive process that goes far beyond merely repairing or refurbishing. 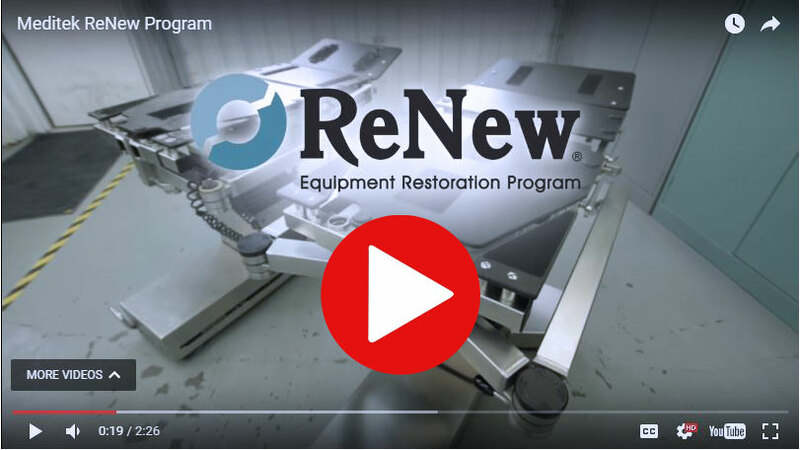 A ReNew surgery table is one that has been completely disassembled and remanufactured from top to bottom. The end result is a surgery table with the same performance, safety, appearance and reliability that a new table gives. Surgical tables are excellent candidates for remanufacturing. Technology for most operating room tables has not changed dramatically in the past 30 years. New features of capabilities such as electrical upgrades, imaging upgrades and many others can easily and very cost-effectively be added to older tables during the remanufacturing process. As previously mentioned, most new capabilities can be added during the remanufacturing process. Remanufacturing the surgical table to its original condition and performance eliminates endless nickel-and-dime repairs and O.R. downtime. Having a surgical table remanufactured usually costs about one-third of the cost of buying a brand-new table. As an example, in 2013 a Toronto area hospital remanufactured their aging and decrepit OSI Jackson Spinal table, which cost them about one-third of what it would’ve cost them to replace that table with the current model. If you are adding operating rooms and need additional tables, you may want to consider purchasing remanufactured table instead of new tables. A Meditek ReNew table has the same performance, reliability and life expectancy of a new table. The Michigan Health Center of Detroit, Michigan saved more than $100,000 when it replaced five very old tables with remanufactured tables instead of buying new ones. When Should a Surgical Table be Remanufactured? An inspection and an evaluation from a qualified remanufacturer is the best way to determine the condition of your surgical tables and what servicing, if any, they require. Your maintenance or Bio-Medical Engineering Department can perform a simple inspection to look for basic signs of wear. Your maintenance and engineering staff generally know when it no longer pays to continue to repair a table. This is the time to Meditek. There are a number of firms today offering repair or refurbishing; however, there are only a few that offer remanufacturing. It is important to understand the differences between a repair vs. refurbishing and refurbishing vs. remanufacturing. How long has the company been in business? How many surgical tables have they remanufactured? How many hospitals or surgical centers have they served? How many are repeat customers? Does the company have an established track-record for longevity and proven success? For whom have they remanufactured surgical tables? Look for referrals of major hospitals in your area. Call these clients and ask whether they are happy with the service they received. Get several references and follow-up with phone calls. Is the company registered with Health Canada? Do they stand behind their work? Look for a minimum unconditional two-year warranty covering all parts and labour. If something isn’t right with your table, the remanufacturer should correct the defect at their expense. How diverse is the service? What types of tables do they remanufacture? Surgical tables only? Or urological, orthopedic, examination and obstetrical? Which manufacturers? Which models? Obviously if your existing inventory of tables is a mixed group of different makes and models, the more diverse the remanufacturer’s skills are the better. Does the remanufacturer have a substantial inventory of surgical table parts and accessories – including armboards, supports, restraint straps, stirrups, conductive cushions, legholders and removable x-ray permeable tops? Keep in mind that if the remanufacturer does not have the parts on hand, they likely can’t remanufacture your table in a timely manner. Will the remanufacturer give you a loaner you can use while your table is away? This is critical – if the remanufacturer does not supply a loaner, can you afford the resulting downtime? Insist that your remanufacturer supply a loaner. How thorough is the company’s remanufacturing process? Is it truly remanufacturing? Or is it merely refurbishing? Or just repairing? The cost is important. After all, one of the key benefits of remanufacturing is that it contains and controls OR expenditures. However, be careful not to be enticed by a quotation that is substantially less than the major remanufacturers are charging. Skimping at this point could leave you completely disappointed. Does the company have product liability insurance? Chances are a portion of your surgical tables require some sort of attention, possibly minor adjustment, major repair or remanufacturing. Others may be in peak condition and require no adjustment of any type. Ideally you will want to keep any eye on the condition of each table so that you can catch problems before they compromise operating room performance and patient safety. The first step is to speak with OR personnel, your maintenance technicians and bio-medical engineers to determine the condition of your existing tables. Determining if there appears to be any immediate candidates for remanufacturing or other repair, these people need to be familiarized with the advantages and cost saving associated with remanufacturing (pointing out that the remanufacturing process achieves high-quality and performance equivalent to new but at a fraction of the cost). Often this allows the purchase of other equipment that they cannot include in their current budgets. In addition to sending out tables for remanufacturing, you may want to set up an annual preventative maintenance contract with the remanufacturer for a program that provides regular inspections and on-site servicing. This keeps all tables in safe condition and ensures reliable performance while minimizing problems and downtime in the OR. In the health care material management field, especially with today’s emphasis on cost restraint, buying a brand-new table every time an existing table wears out or breaks down does not make good sense economically. Remanufacturing offers a sensible alternative that achieves significant cost savings while providing a peak level of quality and performance to the clinical staff and the patient in the OR.